Although nymph fishing has not been considered as glamorous as dry fly fishing, it’s being rediscovered and becoming more popular. Nymph fishing may be the most effective way to catch fish and recently there have been enough articles written about it to make your head spin. While I think that most of these articles have had some valid information, many have been confusing and possibly even misleading to some anglers. I have made my living as a fly fishing guide and instructor for 13 years now in PA, but my obsession with nymph fishing started well before my career, as a teenager on Spring Creek. When I first started fly fishing it was not appropriate, actually it was considered a crutch, to use a strike indicator. Most of the fishermen I knew either used the high stick method, keeping the rod tip high and fishing a tight line, or simply casting their nymphs up and across and letting them swing at the end of their drift. Eventually strike indicators gained popularity and became more practical as new versions came out. They made it much easier to detect a strike and, if you were good, could also help to determine the correct depth and speed. Today most “new methods” are based off of these same styles and theories. Mastering the basics will help you understand any “new methods” you may read about in your favorite magazine. 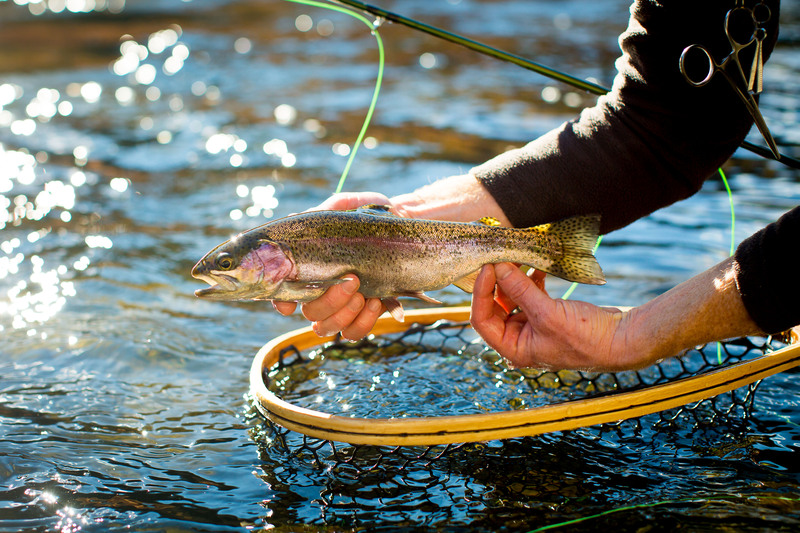 Subsurface fly fishing as we know it today evolved from gentlemen swinging sinking wet flies over a century ago. Many fly fishermen today do not know the history of how things got started in this sport and do not give credit to our forefathers where it is due. One of the first, extremely effective, ways of “nymph” fishing was to cast wet flies or soft hackles across and downstream, letting the flies sink and then swing in the current at the end of the drift. Fish would often take the fly as it drifted somewhat naturally down stream like a natural drifting in the current. The most exciting part of this method was at the end of the drift when the fly would start to swing and elevate from the bottom, at which time the fish would hit a fly, mistaken for an emerging insect, with a crushing blow. Through this method the first emergers were created and the wheels were set in motion to find more successful subsurface techniques. Before the popularity of strike indicators, most of the successful nymph fisherman I knew fished with relatively short lines and used the length of their rod to keep the fly line high and off the currents between them and the fly. Sound familiar? “What’s old becomes new again.” These are the basics of High Stick nymph fishing. By using a longer rod you can control the drift of the fly at relatively short distances, let’s say 20 to 30 feet for your average angler. Keeping the rod tip high and the line tight, anglers would lead the fly or flies through a riffle or run at the same pace as the water. They would sense a strike by feel or the sight of the line moving in an unnatural direction. If you didn’t feel the bottom in your drift you were probably not deep enough and your flies were drifting too fast. The addition and subtraction of weight also was used to control the speed and depth of the drift. Anglers would keep the rod tip high and elevated throughout the drift to keep the fly line off the water and in direct contact with the leader and the nymphs. When high stick nymph fishing, there are two things that should be remembered from the master, Joe Humphreys. Stop the rod high on the forward cast to “tuck” the nymphs into the water first to keep in direct contact with the flies, and each riffle or pocket demands or dictates its own amount of weight. The angler who changes his weight and tailors it to the water will always out fish the angler who fishes the same rig from hole to hole without changing his weight or flies. This method works the best in streams that are small to medium in size with a good amount of pocket water. Over the years strike indicators have lost their stigma and become more acceptable in the nymph fishing world, allowing many fly fishermen to take advantage of this effective subsurface technique. These strike indicators are typically small floats or yarn that are used to help determine the speed of the drift, how much weight is needed, how much leader is needed to achieve the proper drift and to help detect strikes with their movements. Although they may sound like bobbers, they should certainly not be considered mere bobbers which suspend a fly and go under when a fish has sucked in the fly. From my experience most fishermen don’t know how to “read” their indicator and miss most of the important information it is giving to them. When trying to achieve a dead drift or a natural drift presentation it is important to remember one thing. Typically the current moving along the bottom of the stream is slower than the water at the surface due to the friction caused by the obstacles and uneven surface of the streambed. If you are fishing the bottom as most nymphing presentations require, the strike indicator should be moving slower than the bubbles on the surface of the water. This will indicate that you are in the strike zone. Once you have slowed it down, see how slow you can make it go before you hit bottom. This can be done by adding weight and lengthening the leader or a combination of both. As with high sticking you may need to make adjustments several times in a section of stream to insure that you are covering the water properly. Strikes can be detected in several ways and may not always result in the indicator just going under. Many times an indicator will move off to the side in an “unusual” direction, pause slightly, or even lift up or rotate slightly to indicate a strike. It is often said that a good nymph fisherman will find a reason to set the hook in every drift. Most successful nymph fishermen use a combination of all of the above mentioned in their arsenal of tricks on the stream. My favorite tactic on small to medium sized streams is to mix high sticking and indicator fishing in the riffles and runs. I like to take my time and fine tune my rig of flies, weight and indicator to each individual pocket and pick out the fish as I go. I often use a tuck cast and keep a high stick as I guide my indicator and flies through the runs. When I get to bigger water and pools I can then take the same rig, make longer casts and mend my line accordingly to keep the indicator drifting at the correct speed, slower than the bubbles on the current. In the pools I often find myself adding or subtracting weight depending on their depth and current speed. I also find that in deep pools fish may be feeding in different current levels depending on the insect activity at the time. When fishing big rivers I often want to cover a lot of water to locate fish. With an indicator I can make long casts, and using appropriate mending techniques, I can even drift the flies downstream and still have good contact with the flies. If there is insect activity, such as mayfly or caddis hatches, that leads me to believe that swinging a fly at the end of the drift would be effective, I will often extend my drift downstream and allow it to have a controlled swing as I tighten the line to imitate an insect swimming off the streambed. There are often times that this last method works better with standard soft hackle wet flies without an indicator, especially when more action is needed in the flies. No matter what the newest trends are in nymph fishing the basic principles are always in action. The ability to adapt the methods of high sticking, indicator fishing, and swinging wet flies to the types of water and hatches you are presented with will greatly increase your success on the stream. Knowing the habits of the insects that are hatching will help you choose what kind of subsurface presentation is needed to accurately mimic the insects that are hatching. Whether the insects are drifting in the current or rapidly swimming toward the surface will determine if you use a dead drift method or impart motion to your flies. In all cases your choice of flies should be made with an educated decision. Taking a sample with a kick screen or visually scanning the water and rocks can give you the answers you need for both fly selection and movement. A fisherman should have a good selection of nymphs covering the basic sizes, shapes and colors of the local nymphs. Pheasant tails, Hare’s Ears, Bead Head Caddis, and Stoneflies in several sizes are all staples. Attractor patterns such as Copper Johns and Prince nymphs also should be carried in appropriate sizes. Armed with this information you should be much more prepared to decide on the best tactics to use on your favorite trout streams and any new streams or rivers that you may visit. As I mentioned before I and many others like to employ a mixture of these three basic tactics. In close pocket water high stick nymphing is hard to beat. As the casts get a little longer and the pools get deeper the indicator starts to come into its own. If the fish are chasing caddis or active mayflies, which is often indicated by splashy rises or fish leaping out of the water, lifting or swinging a nymph or soft hackle wet fly at the end of the drift may be an appropriate choice. Being creative and experimenting with all of these methods will help you become a better fisherman and develop your own tactics for approaching subsurface fishing.